Home » Mobile Game » Android » Download NOW – Iron Blood, NEWEST Monster Hunting RPG! Hunt down all the monsters that bring chaos in Visus Empire. Bring back the peaceful time in the empire through the use of 4 interchangeable heroes: Warrior, Knight, Archer and Magician. Each stage became difficult so better equip each character with a hard-knocks equipment, armor and accessories you can get through expeditions and special item sale. Experience this massive combat game on your mobile device now! Encountered monsters can be your great ally during arena. Gather as many monsters as you can to win Arena! Its console-quality 3D graphic takes place in the unearthly world with thousands of loot to gain. Download the game now and vanquish the darkness brought by Hades as he summons strong beasts to bring wrath in Visus Empire! To know more about the game, feel free to visit its Official Facebook Fan page. ★ Iron Blood’s high-quality 3D graphics! ★ Battle out nemesis of Visus Empire! ★ Acquired Monsters – Clash and Defend! Romania is a continent where elves, dwarfs and mythical dragon had coexisted with the human, and they had lived their lives under their own Kings’ rule without any conflict. When the evil guardian Hades appeared, he brought chaos and conflict between mortals and other race. After the 100-year war brought by Hades, Romania is so much devastated. The human started to improve and adapt different techniques to fight back Hades when time he rises from the ground. Then Visus Empire was established. The Empire has the strong will to defeat Hades, but civil turmoil arises when their King passed away. Two princes of the Empire, eldest Kraus and the youngest Ardin started to conduct a veiled feud who should rule the empire. Little did they know, Hades came back to ruin everything again. The two ruling duke’s family, Latel and Prime has to take sides, the Duke Latel stands for Prince Kraus and the Duke Prime stands for Prince Ardin. With the turmoil happening within the Empire and the attack of Hades, how they can totally defend two opposing attacks happening? 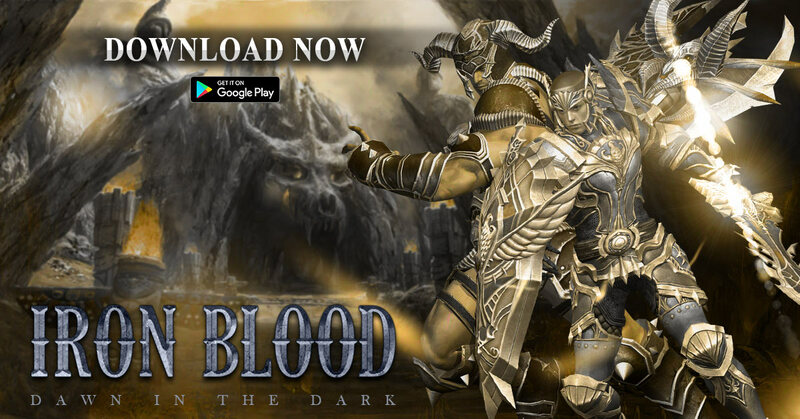 Iron Blood: Dawn of the Dark is a free-to-play app published by OnPlay and developed by Dylab. Gamers have an option of in-game purchases. The release in iOS will follow afterwards. Next Fantasy Squad Hits 10K LIKES – New SNS Event Unfold!